I made up this recipe years ago and we enjoying them every season since. I think it’s because of my secret ingredient…actual HOT COCOA! Not the powder, but the real deal. I think it makes it more moist and gives it the best flavor. Not to mention the handfuls of marshmallows that are added at the very end. Grab a glass of milk OR some hot cocoa and enjoy it with these yummy cookies. Beat the butter until smooth. Mix in the egg. Add the hot cocoa liquid, oil, and vanilla. Mix well. Add the cake mix slowly. Mix well after each addition. Stir in chocolate chips and mini marshmallows. Scoop a tablespoon of dough and place on a baking sheet that has been lined with parchment paper. Add 3 marshmallows to the center of the cookie. Bake for 6-7 minutes. Try to not OVER BAKE the cookies. I’m thrilled to be teaming with some of my favorite food blogging friends today to bring you a virtual Christmas cookie exchange. Have you ever been to a cookie exchange party? It’s so much fun because you go to the party with one kind of cookie, but come home with dozens of different cookies to enjoy! Here are 40+ delicious cookie exchange recipes all in one place so you can find the perfect cookie to take to the party this Christmas season. Now it’s time to party! 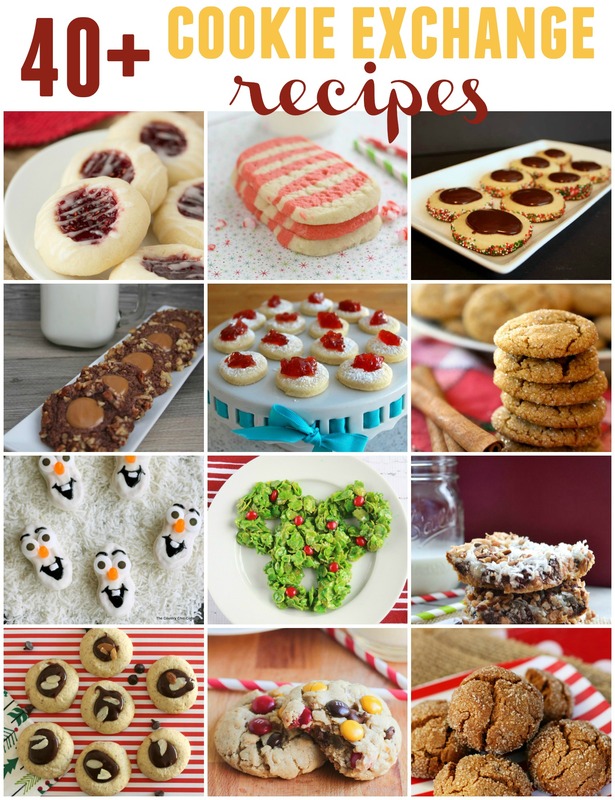 Check out all the other delicious cookie recipes. I would love for you to come back and let me know which ones you will be making this year! Have fun!